In the opening sequence of MARY POPPINS RETURNS, the cheery lamplighter cycles round old London at dusk lighting up the lamps, including Blossom St in Norton Folgate, Spitalfields – an atmospheric example of the capital’s surviving nineteenth century streetscape. Too bad that British Land are set on demolishing most of it this year and replacing it with a hideous corporate plaza, granted permission in 2015 by the former Mayor of London Boris Johnson who employed his autocratic power in overturning Tower Hamlets Council’s rejection of the scheme. Before long, the scene in MARY POPPINS RETURNS will exist as a poignant record and reminder of the loss of the medieval liberty of Norton Folgate. At this moment, we face a slew of exploitative new developments that threaten East End heritage without delivering significant benefits to the people of East London, so I thought I should outline some to you in order that we may prepare ourselves for the fights which are in store. 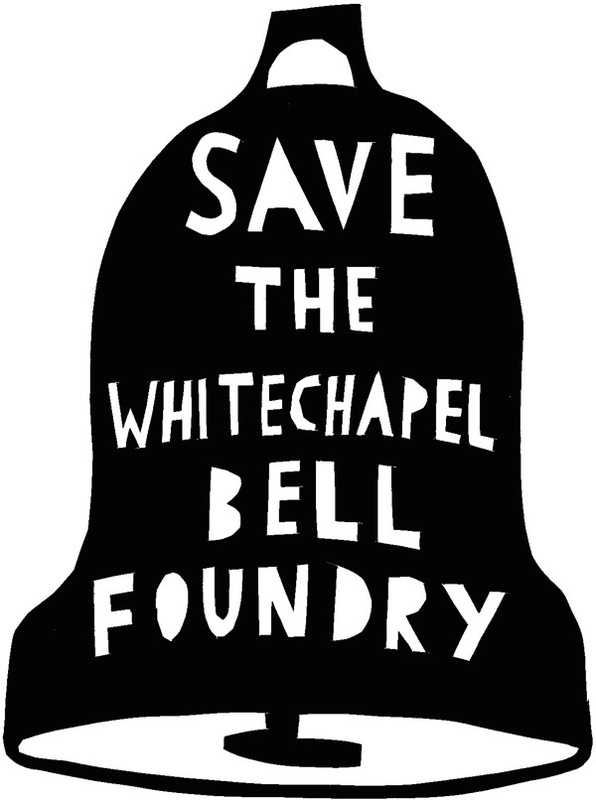 We have learnt that Raycliff, the developer who bought The Whitechapel Bell Foundry has just submitted a planning application to Tower Hamlets Council seeking permission for change of use from foundry to bell-themed boutique hotel. We support the UK Historic Building Preservation Trust (founded by HRH The Prince of Wales) and Factum Foundation’s joint scheme to reopen the foundry as a state of the art operation for bells and art casting – marrying old and new technology, and with a strong element of apprenticeships and training. It will take a few weeks for Raycliff’s application to be processed by the Council planning department and become public. Once this happens, we will advise readers of the most effective way to object. 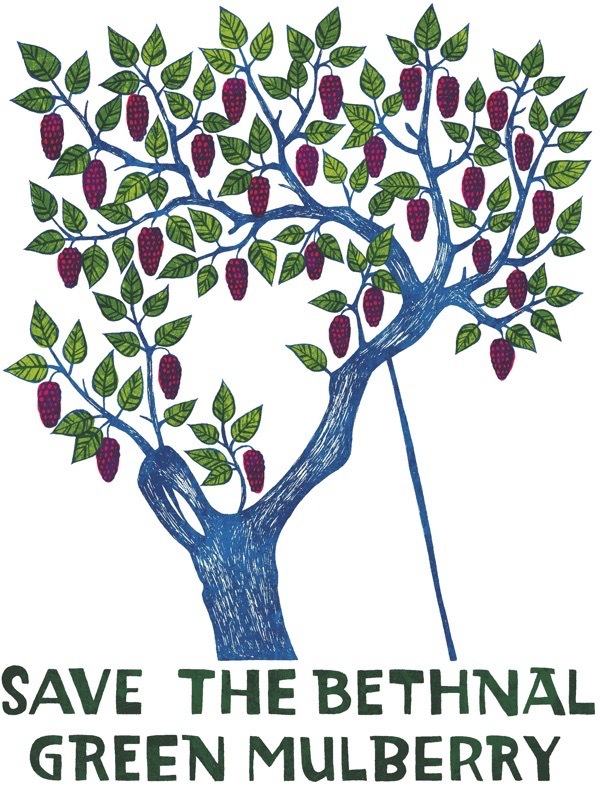 Meanwhile, we plan to stage a legal challenge to the Council’s decision last September granting Crest Nicholson permission to dig up the four hundred year old Bethnal Green Mulberry tree in the grounds of the former London Chest Hospital. We believe that the Council’s interpretation of the planning guidelines revised last July to extend further protection to Veteran & Ancient Trees, which can only be sacrificed in ‘wholly exceptional circumstances’ is questionable. We also consider it to be a poor development with too little social housing that will do irreparable damage to the Victoria Park Conservation Area. Currently the application is with the Mayor of London’s office and only when the decision is ratified can it be challenged. We will be sure to keep you posted of this and other developments on the horizon. 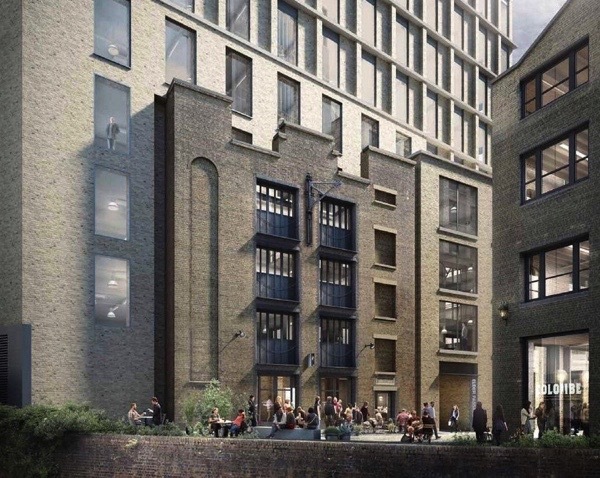 ‘A kind of authenticity’ – facadism to come in Norton Folgate according to British Land. The developer’s image is tactfully cropped at the top to conceal the full height. 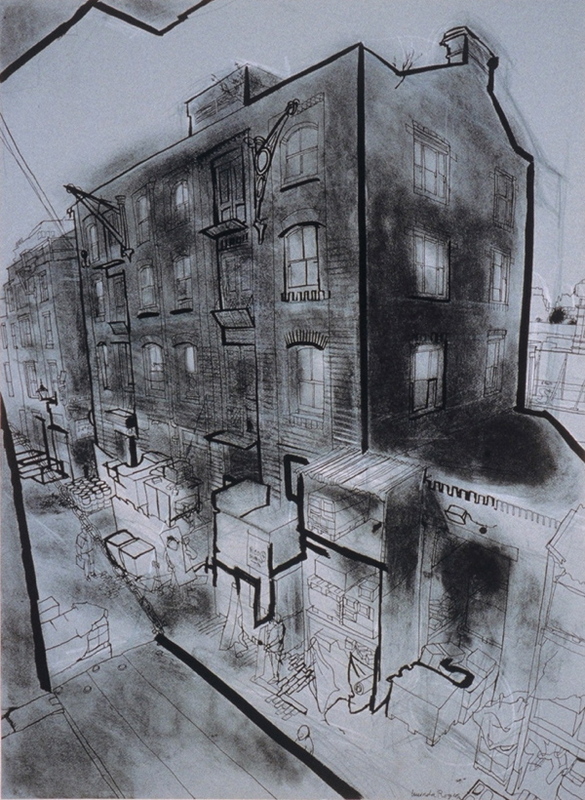 Norman Foster’s proposal for a tower at the corner of Commercial St & Whitechapel High St, facading the current building. Again, the developer’s image is tactfully cropped at the top to conceal the full height. Fortunately, Historic England have objected to this monster in a Conservation Area, so it is unlikely to go ahead. There are times when you read things like “…reconstructing The Still & Star nearby using a surreal, Alice-in-Wonderland-style assemblage of casts of the exterior of the old building in green concrete.” and wonder whether you’ve slipped through a rift in the space-time continuum to arrive in some bizarre dimension where such things are considered not only feasible but desirable. I agree with all of the above comments…grrrrrr!!! I can’t believe how short sighted the planners are…. Truly depressing news….pen at the ready and sleeves up for the fight ahead. 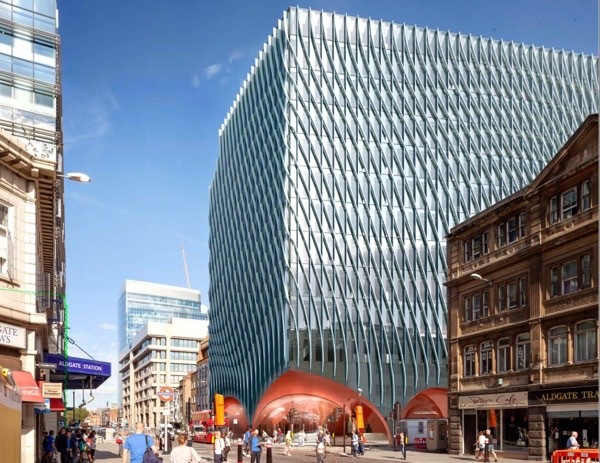 East London is being suffocated by ‘corporate plazas’ and ‘ high end shops’, the proposal to build ‘posh shops’ on the Old Street roundabout yet another example of the greed of developers. Thank you GA for keeping us all in the loop. Thank you for highlighting all of these once more. We all need to get busy to save our heritage from these developers. Your actions to save indigenous buildings are inspirational. I’ll apply your grit to fight the outrageous land proposals in my own part of the world. Utterly preposterous! This sort of absurd folly is the reason I joined the Victorian Society a couple of years ago. Makes me wish I had the funds to buy up all these beautiful old buildings and maintain them and with them the spirit of the East End. I’ll be signing all available petitions and join in all the action I can in order to stop this. Keep up the good work GA! Thanks for bringing the proposed wanton destruction of the East End to our attention. My immediate reaction to the casting of The Still and Star in green concrete was “You cannot be serious!” How anybody could think this is a good idea is beyond me. 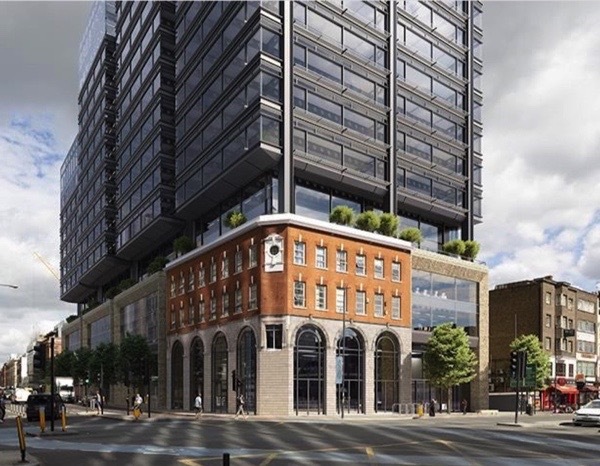 London will soon be a ghost city full of high rise office blocks. How depressing. Thank you, Gentle Author, for keeping us updated and for giving us information on how to resist these horrible threats to the grand architectural heritage of the East End. Of course the council will succumb to the argument about jobs and how the new buildings will benefit the local economy and this is why the developers will have their way. Its time to get rid of the illusion that ripping the heart and soul from an area by making it just like any other place will benefit it in the long term. Look at what they have done to our high streets. Absolutely ruined them! by building faceless shopping malls Of course they did not have the foresight to think of the internet and how it would affect shopping. All the malls are the same with empty shops that are impossible to let. The future must not be left in the hands of developers out for a quick buck . Councils must be forced to think futher than the next payday. How disappointing: I thought Norman Foster had a degree of sensitivity, but this conclusively proves otherwise. 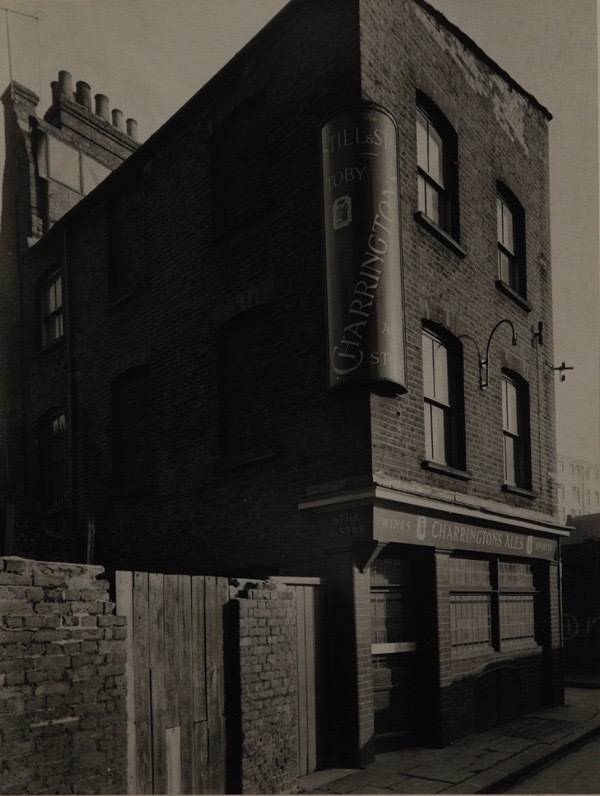 For those of us far away but eager to help preserve something of old London, are there any ‘friend’s organization(s) where we can send financial support? Is this a a look into the future ? Going into a concrete replica Victorian pub drinking a synthetic pint of bitter from a plastic demi litre tankard? The mid boggles! thank you for the work you are doing to draw people’s attention to the continued destruction of the East End to satisfy corporate greed. This was a comment from somebody who is not a Londoner and has not seen anything like it before. Her visceral reaction tells me that on no level does facadism work, aesthetically or for preserving historical fabric. As if I needed to be told!